WordPress is one of the most popular platforms for creating websites. Chances are you might even be using WordPress for your own website! 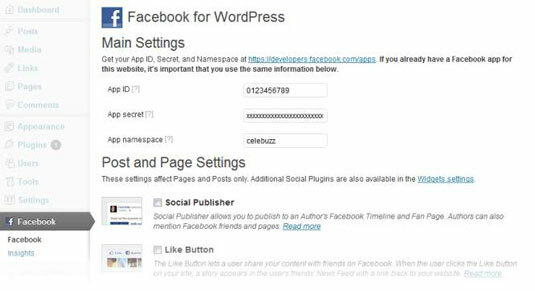 Facebook has a WordPress plug-in that makes WordPress sites more social without the need to pull code from the Facebook Developers Social Plugins site. Post to an author’s Facebook timeline whenever the author publishes a new WordPress post. Tag friends and Facebook Pages — this posts to their timelines as well as lists them on the WordPress post or page. Post all new WordPress posts or pages to a specified Facebook Page. Enable fully customizable Like, Send, and Follow buttons in a single click. Add Facebook Comments, including full SEO (search engine optimization) support. Use Open Graph Protocol integration. Add a Recommendations Bar, which allows users to click to start getting recommendations, like content, and add what they’re reading to their timelines as they go. Automatically publish WordPress posts to your Facebook Page — you can even tag other Pages or friends in these posts. You can install Facebook for WordPress either via the WordPress.org Plugin Directory, or by uploading the plug-in to your server (in the /wp-content/plugins/ directory). If you have a WordPress website, chances are you already know how to add a plug-in. After activating the plug-in, you are asked to set up your Facebook app, with step-by-step instructions. Configure the settings page to your liking.